Horne Lake Regional Park is located at the west end of Horne Lake beside famous Horne Lake Caves Provincial Park. 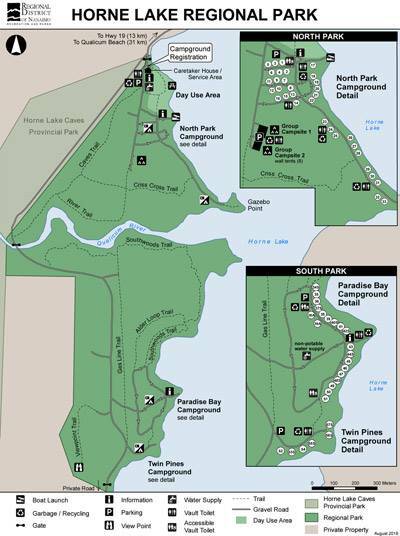 The Park has over five kilometres of lake and riverfront to explore along with a boat ramp, canoe and kayak rentals, a network of forest trails, and a day-use picnicking area that compliment the campground's rustic wooded and lakefront sites. Individual campsites and group camping are available year-round with campsite reservations accepted between April 1 and October 15. 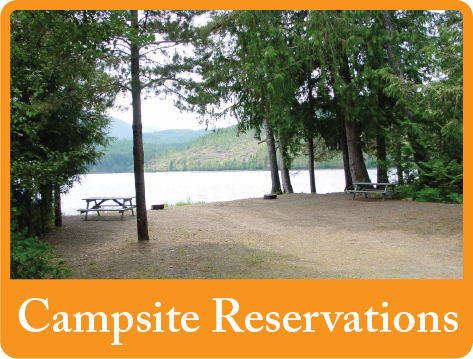 Reservations for campsites at Horne Lake Regional Park can be made up to four (4) months in advance and up to two (2) days prior to your arrival date. The maximum stay is fourteen (14) nights. Same day reservations are NOT available online. If you do not have a reservation, you can check campground availability online to determine if there are any campsites available on a first-come, first served basis. 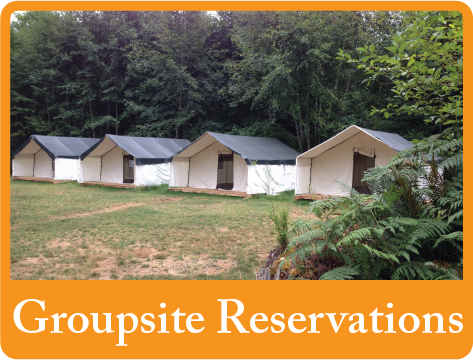 A maximum of three (3) sites may be booked with one reservation. A $6.00 non-refundable reservation fee will be applied to each booking. Statutory Holiday Weekends - A minimum 3-night stay is required. For more information please call 250-248-0500 or email hornelake@rlcparks.ca. Full payment is required at the time you make your reservation or change an existing reservation. All reservations must be paid with a credit card. Please note that a minimum 3-night stay is required on statutory holiday weekends. Cash Only - No Cheques or Credit Cards accepted during the Low Season. The site fee includes only one vehicle. If you have an additional vehicle, and space is available and approved by park staff, a second vehicle (non-RV) will be allowed at 50% of the nightly fee. A consecutive day pass is available for $75.00 (plus tax) for a maximum 14 nights. Campsite reservation changes can be made by contacting the reservation call centre at 250-248-0500 or by email at hornelake@rlcparks.ca. Changes cannot be accepted online. There is a non-refundable transaction fee of $6.00 to each reservation change. Date changes need to be made at least seven (7) days prior to your arrival date. After a date change has been made, the reservation can no longer be cancelled. Cancellations can be made by contacting the reservation call centre at 250-248-0500 or by email at hornelake@rlcparks.ca. Cancellations and refunds cannot be accepted online. Bookings cancelled within two (2) days of scheduled arrival date: no refund. Bookings cancelled within a week (7 days) and at least three (3) days before arrival date, forfeit one night's camping fee. Bookings cancelled more than a month ahead: full refund. Refunds are not given for an eviction, vacating your campsite early, or inclement weather. Please call 250-248-0500 or email hornelake@rlcparks.ca. Group Site #1: An open grassy field with a central campfire ring, picnic tables, and pit toilets located nearby. Available April 1 - October 31. Group Site #2: An open grassy field with a central campfire ring, picnic tables, and pit toilets located nearby. Between May 1st and September 30th, the site is set up with six (6) large canvas tents on wooden platforms. The tents are 14x16 feet in size and can sleep 8 + youth. Group Site 1 fees apply during the shoulder seasons. *Youth Group: k-12 school, not-for-profit youth organization, or youth program run by a recreation centre taking members who are 18 years of age or younger for overnight camping trip. RLC Park Services provides outdoor education programs including Stand-Up Paddle Boarding, Canoeing, Wilderness Skills and Survivor. Many groups combine the programs held in the Regional Park and the on-lake programs with the programs offered next door at Horne Lake Caves Provincial Park. If you are interested in booking programs, please identify this at the time of your group site booking. For more information please call 250-248-0500 or email nature@rlcparks.ca.